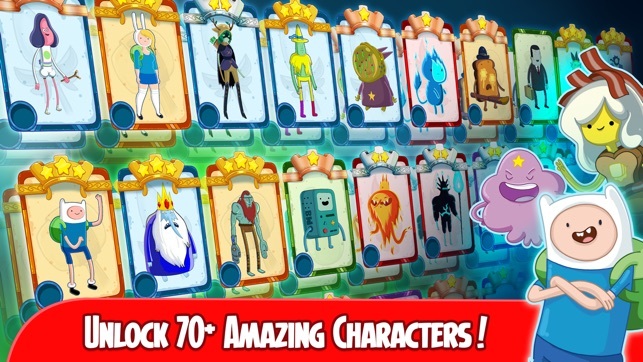 Play as the greatest heroes and villains from across the Adventure Time Multiverse! Team up with Finn, Jake, Princess Bubblegum, BMO, Fionna, Cake, Marceline, Young Billy, LSP, Farmworld Finn, and so many more! Command your team in real time! Develop a winning strategy to crush your opponents in tactical turn-based RPG combat. Use simple gestures to summon mathematical attacks! Bust out special Tricks and Artifacts to do even more damage! Seek you glory? 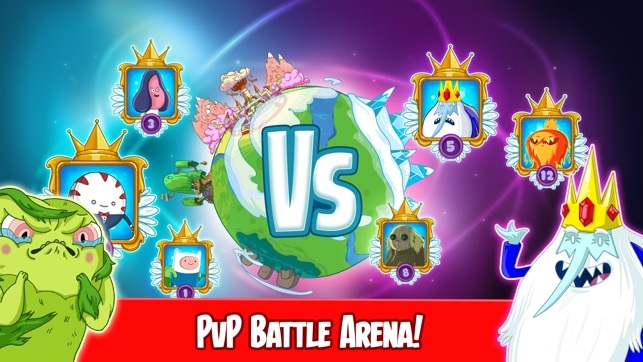 Battle other players in the PvP Arena! Rise up the ranks as you dominate the leaderboards with your warrior skills. Upgrade your champions to unlock even more powerful attacks and claim bigger victories! 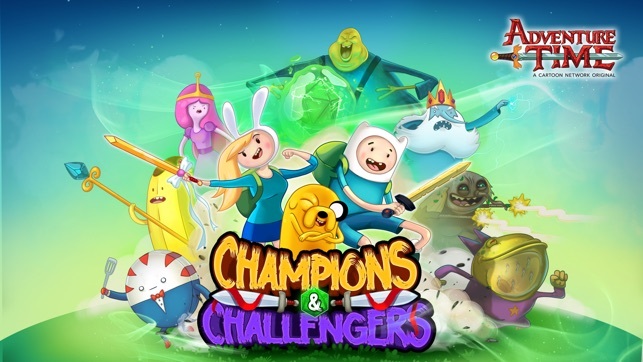 Assemble a squad of champions and challengers from all over the Land of Ooo! Each champion has a unique set of powerful attacks. Combine character abilities to smash your enemies and foil the Dice Lord’s plans. If you're having any problems with this app, feel free to contact us at atchampions.support@yesgnome.com. Tell us about the issues you're running into as well as what device and OS version you're using. This app may contain ads that feature other products, services, shows or offers from YesGnome and other partners. We appreciate your feedback. Thanks for playing the game! 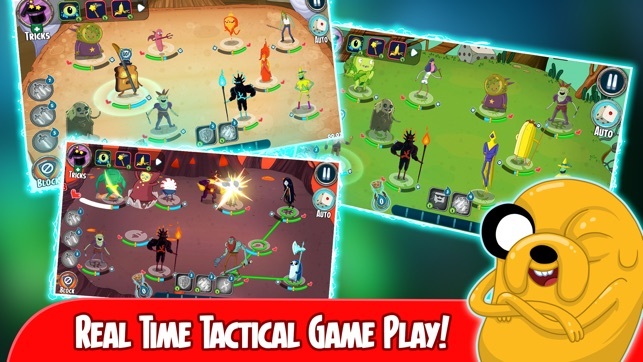 This game is super fun and would be worth playing for any Adventure time fan, however, it isn’t perfect and fans of this genre/type of mobile gaming might get bored of it quickly. The block button is at the very bottom of my screen (on iPhone 5) and when I try to push it the swipe up menu slides up just a tiny bit causing the game to pause. When you unpause by that time blocking is out of the question because you will already be getting hit by your enemy. The game rarely freezes on my 5 but it still does occasionally (it’s happened like 2 times in the few weeks I’ve been playing) oh and the biggest issue that needs fixin real quick (that is if they even update this app anymore) is the swiping to attack your opponent. So many times I have swiped the enemy I want to attack and then my character attacks a different one..... perhaps just tapping the enemy you want to hit would be better/easier to work into the gameplay? Overall I’d recommend it to an adventure time fan but not to fans of this genre (similar to summoners war type games) not sure what the exact name for that mobile genre is lol. Or if you are fans of both AT and summoners war. 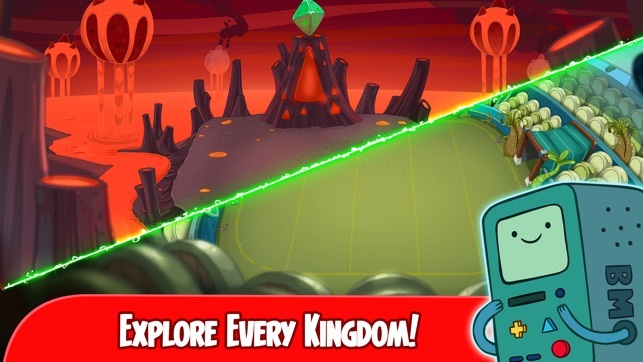 First of all, I gave this app 4 stars because I love Adventure Time, and I love this game and its potential...BUT the SHEER amount of times that it crashes on my phone, AND the SURPRISING amount of times that the game freezes, attacks the wrong enemy, fails to use an ability that I select due to freezing mid-ability (while the battle is still going), preventing me from doing anything else...it’s inexcusable. It hurts me to say that because I love the game, and I can tell a lot of time and effort went in to it. But those things mentioned above happen wayyyy too often, to the point where I just put it down for the night to write this because I simply can’t keep trying to play with so many issues preventing me from enjoying the game (and, well, preventing me from even playing at all). If it wasn’t Adventure Time, and if it didn’t have a ton of potential, I’d give it 3 stars or less. It has issues that should NOT be happening at all, at LEAST not NEARLY as frequently as they do. And I’m playing on an iPhone 8 that is up-to-date, etc. I wanted to like this game so much given the IP and the tactical nature of combat, but the game doesn't explain much about how loot or rolling heroes works, which would only bump the game down a star or two, but I tried the arena mode today to finish a daily quest for 12 wins. I got to 11 and DC'd after winning the twelfth. No big deal, load back up (it ate my coins and gave me nothing in return). Lost several times in a row since the arena mode seems to occasionally just pit you against teams that severely outlevel you, which is basically a guaranteed loss. Finally win my 12th- awesome. Oh- never mind, I DC'd again. Lose twice more to stronger teams- getting exceptionally frustrated now. Go in and win my 12th for a THIRD time only to DC again as my characters celebrated their futile march against this game's awful design. Done. I can't be bothered with a game that can disconnect me so often if it doesn't at least save my progress or refund my resources or something. I was enjoying it until that horrible nonsense.